by Hugo Castillo Sánchez. Published on 8 December 2016. This post was part of the Chalkdust 2016 Advent Calendar. Winter is coming. Or, to be more precise, the winter season begins on 21 December. Some people hate it, while others (like me) love it. Every time we hear the word winter, we think about that cold time of the year when we wear our scarves, jackets and coats, and we gather with our loved ones and eat (lots) of delicious food. But if you were asked to describe the word ‘winter’ with a simple symbol, what would that symbol be? Most of us would probably think of a white, beautiful snowflake. 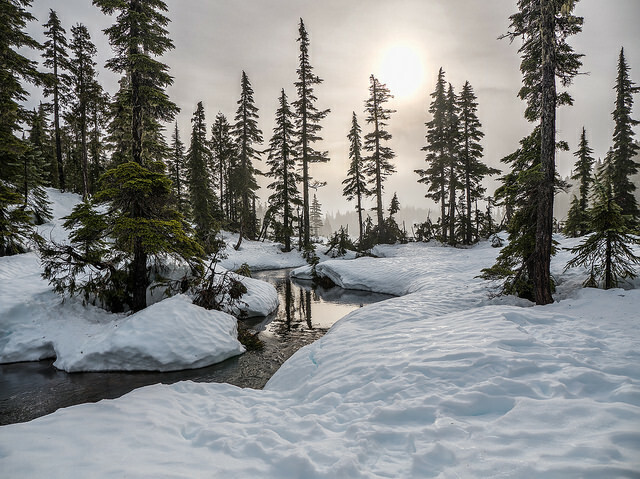 And we are not the only ones thinking of that: if you Google the word ‘winter’ and go to the image section, you will find lots of pictures of them. The snowflake is the most iconic symbol representing cold weather, and is also a traditional image used during the Christmas period. It is well known that most snowflakes have six-sides (hexagonal pattern) and many branches around them; but apart from that snowflakes come in a large variety of shapes and sizes, leading to the common phrase “no two snowflakes are alike”. But how is a snowflake formed? 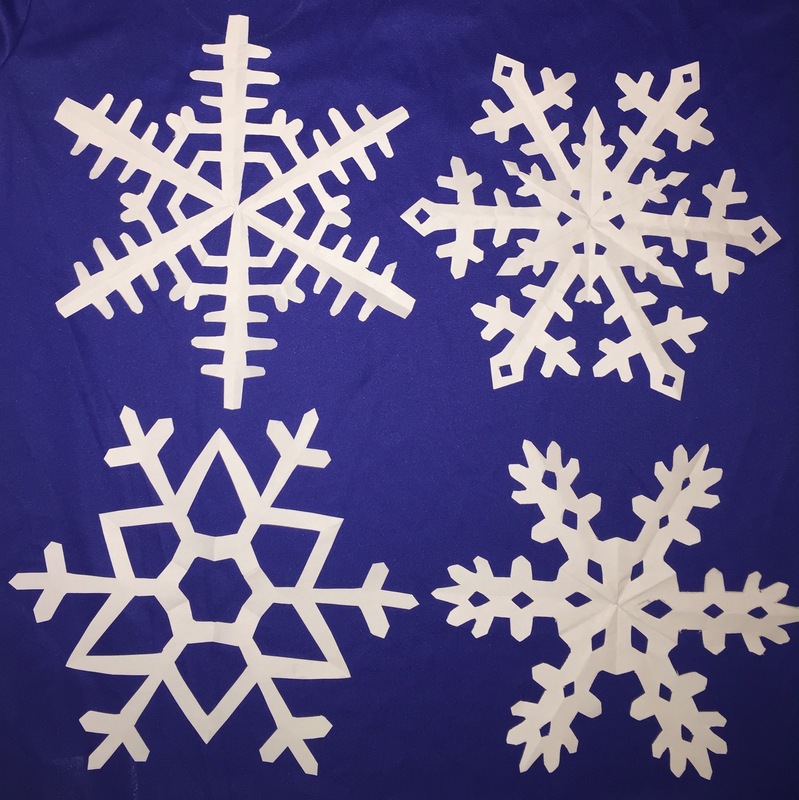 In this blog, we will describe the process of snowflake formation, and explain why they exist in a variety of shapes and sizes. To do that, we just need to understand some basic concepts: humidity and supersaturation. Many of us, before going to work, college or university, will check the weather forecast in order to decide if we need to wear our coats or bring an umbrella with us. If you visit the BBC weather page, you can find plenty of information about the forecast of a particular day; and you will probably be familiar with the minimum and maximum temperature, visibility and chance of rain. But there is another piece of information that is always reported which is relevant for this blog: the relative humidity of a city, which is normally expressed as a percentage. What does that value mean? In simple words, humidity is a measurement of the amount of water vapour in the air, and this system can be seen as a mixture, with the air as the solvent and the water as the solute. Or, you can think about it in a simpler way: as a wet sponge, where the air is the sponge that will be holding water. The temperature of the environment affects the humidity: the higher the temperature, the more water vapour the air can hold (and vice versa). But there is a threshold: for a fixed temperature (say 20 C) the air cannot absorb and hold unlimited amounts of water. The concept of relative humidity (RH) is basically the ratio between the current amount of water vapour present in the air and the maximum amount of water vapour that the air could hold at a given temperature, expressed as a percentage. For instance, if the forecast of a sunny day reports a relative humidity of 60%, the air can still hold more water (at least 40 percentage points more). If we see a relative humidity of 95%, it means that the air is almost full of water, and can hold just five percentage points more. Low temperatures tend to give high values of RH, and high temperatures tend to give medium and small values of RH. The formation of snowflakes requires high values of relative humidity, meaning that it is necessary to have too much water vapour in the environment; or, in fewer words, we need clouds, as this is the place where snowflakes are born. However, we still need something more. 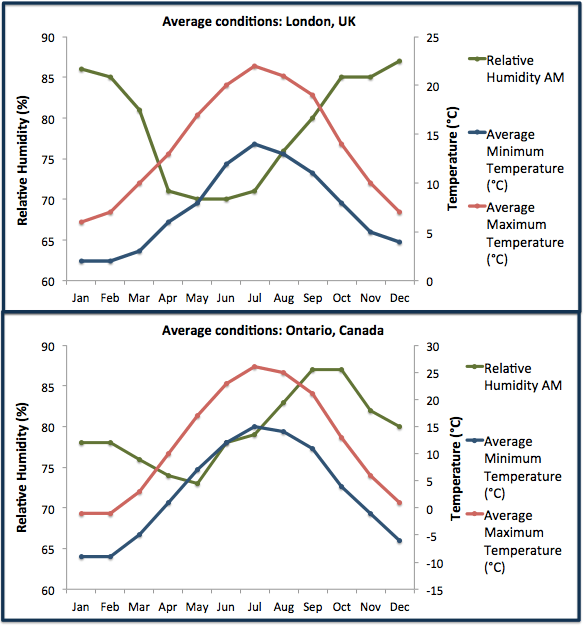 In the figure below, we can observe the average maximum and minimum temperatures and RH registered during 2016 in two cities: London, UK, and Toronto, Canada. We observe that London always has high values of RH (hence the cloudy weather), and in winter seasons these values tend to increase even more. 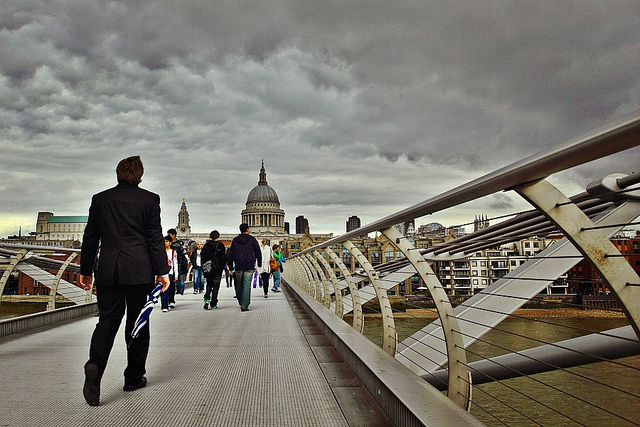 Unfortunately (or fortunately, depending on your point of view), London rarely experiences snowfall, because the temperatures aren’t usually low enough (around 4–6C). On the other hand, the city of Toronto is a snowy place and, although it has RH values similar to London’s, its average temperatures are expected to drop below 0C. So, we need high values of RH and low temperatures, but this is still not enough to form snowflakes: a particular unstable condition in the clouds has to be present: supersaturation, occurring when there is more water vapour in the air than the ordinary limit of 100%. This phenomenon has a cause: imagine that the temperature is 4C, and RH reported is around 96% (which is almost the maximum capacity of air). If the temperature decreases below 4C, the water vapour-holding capacity of the air will decrease (the RH will increase), which is an unstable situation. The air has to do something in order to return to the stable state: the excess water vapour crystallises out, either into water droplets or directly into ice, depending on the temperature of the cloud. As we saw, supersaturation leads to the formation of water droplets. The life of a snowflake begins as a tiny droplet of supercooled water that freezes in the clouds to create an ice crystal. The droplets might freeze if the temperature of the cloud is cold enough. If the clouds are warmer, the crystal formation can begin around a nucleus such as an impurity (a dust or pollen particle) in a process known as nucleation. a) A single particle of dust is floating in a cloud. The dust will provide a solid surface where the freezing process will start. b) Water vapour will stick to the particle of dust, condensing onto its surface. c) This stage is one of the most important: the water will turn into ice. The arrangement of the molecules of a substance determines the way it crystallises: water freezes into a hexagonal structure. This hexagonal formation allows water molecules (each with two atoms of hydrogen and one of oxygen) to form together in the most efficient way. This tiny crystal can be seen as a seed from which a snowflake will grow. d) The six corners of the hexagonal structure of the crystal grow faster because they stick out a bit farther into the humid air, so they collect water faster than anywhere else on the crystal, causing branches to sprout. And as the conditions around the snow crystal are almost constant, the arms grow out at roughly the same rate (symmetry). e) Randomness takes over here: the conditions might favour the growth of new plates, the formation of arms/branches on the new plates, and so on. The snowflake grows as water molecules in the air join the ice crystal, until it becomes heavy enough to fall to the ground. The temperatures still have to be cold enough, otherwise the snowflake will melt and the result will be wet snow. The stage e) mentioned above and what comes after it are, overall, a complex dynamical process: since the snow crystals fall through the cloud, they experience different temperatures, humidities, air currents and physical processes along their descent, and thus the snowflake structure will always be changing with time. 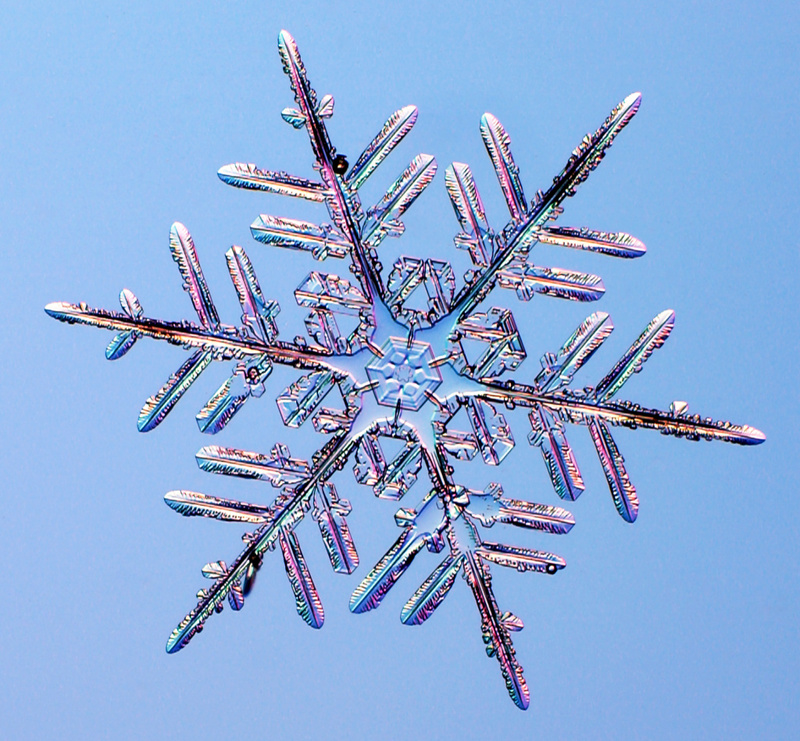 The final result is the complex and unique pattern of a snowflake. Watch fascinating real movies of growing snowflakes here. Modelling snowflake formation mathematically is a real challenge, because it involves lots of different physics (liquid-vapour phase transformation, thermodynamics, energy and mass transfer) is dependent on time and on the meteorological conditions, and so on. Researchers have studied this process for a long time. 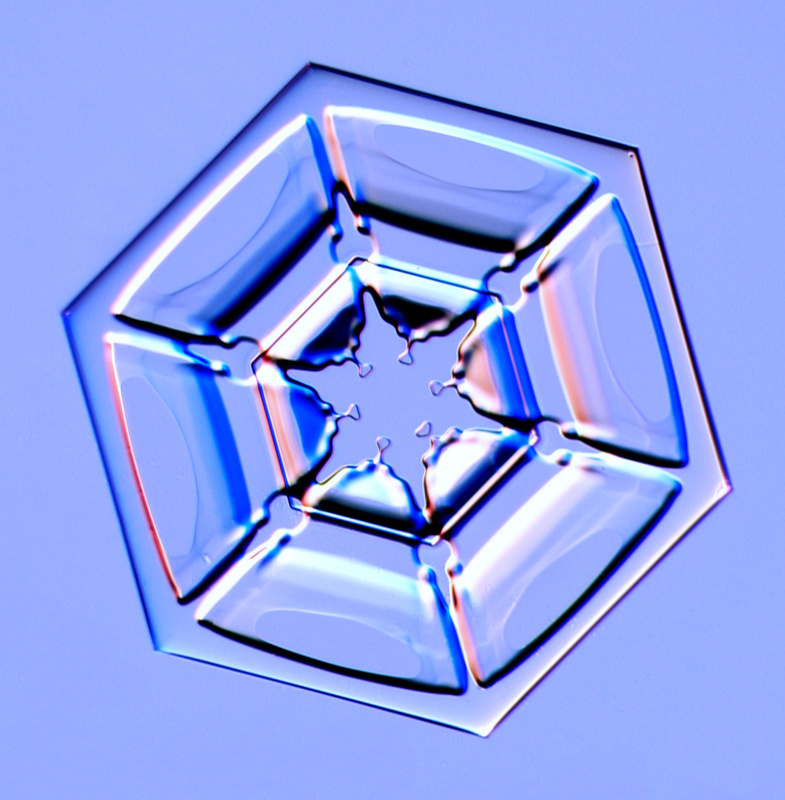 One of the most famous researchers in this area is a Japanese physicist called Ukichiro Nakaya, who was the first person to carry out snow crystal formation experiments under controlled conditions in 1930. He observed that the morphology of the snowflakes depends on the temperature and the conditions of supersaturation. 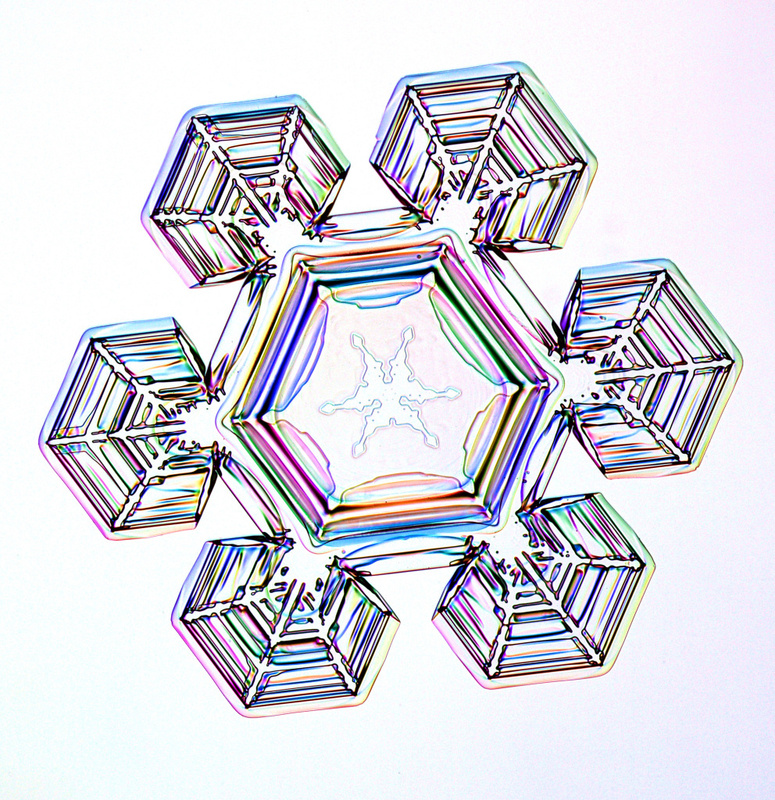 All his observations and results can be summarised in the snow crystal morphology diagram. The diagram provides information about the different types of snow crystals that grow in air at atmospheric pressure as a function of the temperature and water vapour supersaturation (grams of water per cubic metre). At small values of supersaturation and temperatures greater than -5C, small plates will be obtained. 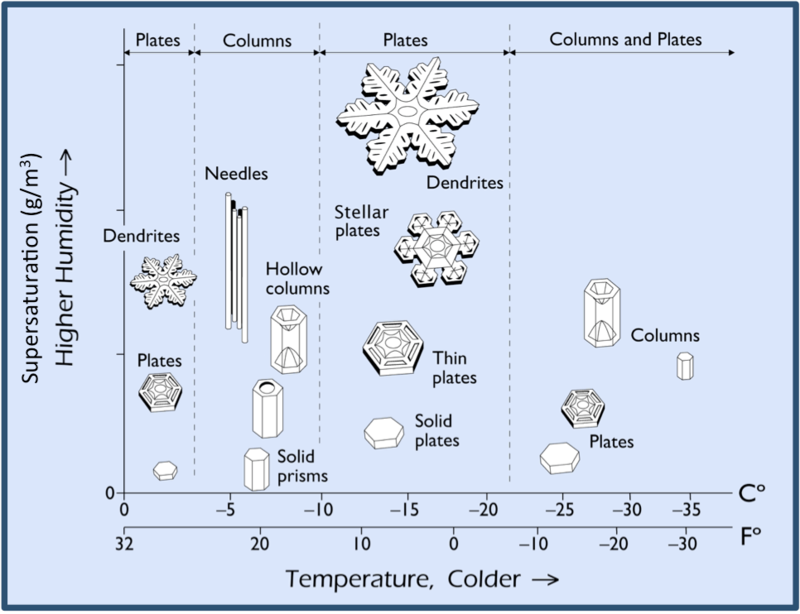 It is surprising how the morphology of the snowflakes changes drastically at even lower temperatures: from columns and solid prisms (-5C) to solid plates (below -10C). The temperature mainly determines whether snow crystals will grow into plates or columns. When the values of humidity are low, the crystals will grow slowly and simple forms will be obtained. When the humidity is higher, the crystals will grow rapidly and then branched and more complex forms appear. In few words: higher saturations will produce more complex structures. The information and observations of this diagram have been proven and confirmed experimentally during the last years, and it has been extended to temperatures of -70C. The most famous snowflake structure is the dendrite structure, whose name means tree-like. It is easy to identify due to its branching structure. 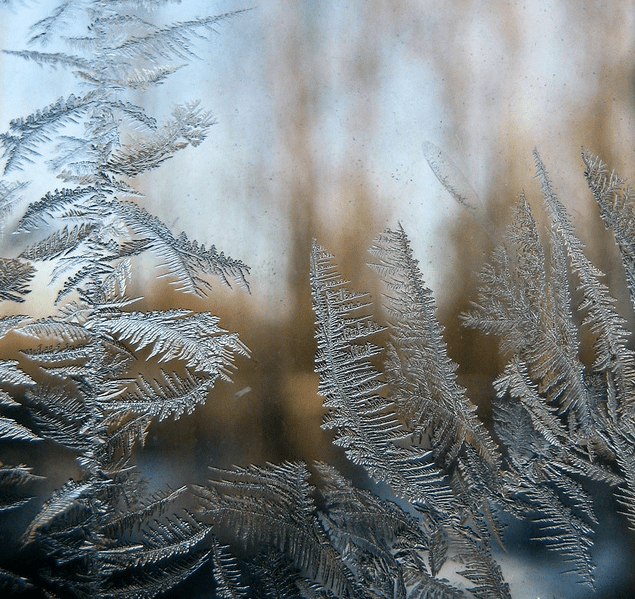 Small dendrites are obtained at temperatures around -3C, but bigger ones are seen in colder temperatures (-20 to -25C), and this is because the atmosphere contains more moisture. Another beautiful and recognisable snowflake is the sectored plate which forms a hexagonal pattern with a star-like shape in the centre, and this structure is seen at almost similar temperature conditions for the dendrites, but with lower values of humidity. The thin-plate snowflakes cannot obtain sufficient moisture to form branches. These crystals tend to form at warmer temperatures. Some researchers around the world are modelling the structures of snowflakes, others are simulating the formation of a snowflake using complex models, others are attempting to apply chaos and fractal theory to explain the formation of the branches and the complex patterns of the snowflakes. There are still some mysteries that remain to be answered about this wonderful phenomenon. Special thanks to Prof. Kenneth G. Libbrecht for allowing us to use his pictures. Visit his page Snow Crystal for further information: it is full of wonderful and interesting things about snowflakes. Hugo is a chemical engineer doing a PhD in Mathematics at University College London. He is currently working on non-Newtonian fluid dynamics. He is also interested in transport phenomena and rheology (the science of deformation). Why do Christmas lights get tangled? And what's the perfect way to decorate a Christmas tree? Find the answers here. Christmas is coming, and Santa will soon begin his journey. We analyse the science and maths behind his trip. While drinking beer in your favourite pub, have you ever wondered how it is produced? Find here some of the science and mathematics behind brewing. ← What should you get a mathematician for Christmas?